Welcome to Women on Wine. 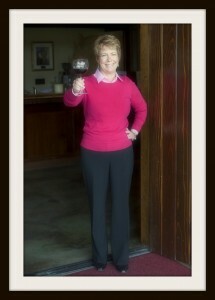 My wife and partner in crime Laura is authoring a series of stories about the women of the wine industry. As always, we welcome your input. First I wondered if that was a remarkable statistic. It is. 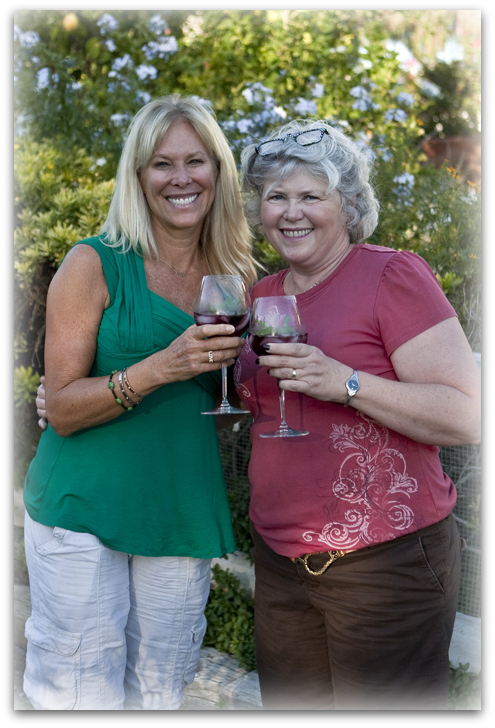 Roughly 7% of 3000 California wineries are owned by women. Of all wineries in the United States only 35% employ women at all. Next my thoughts ran to what differences I might find in a woman-owned and managed winery. To answer this question I decided to spend some time exploring Keyways and then meeting Terri herself. 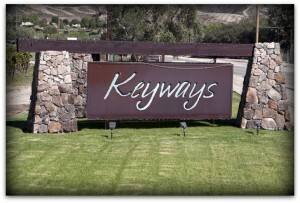 Keyways Winery is on the De Portola Trail in Temecula, several miles south of the main wine drag of Rancho California Road and decidedly where horse and wine country meet. The landscape is quite pastoral – rolling hills with mountains in the distance, nary a store or industrial park in sight. Vineyards of Zinfandel grapes were planted here in the 1960’s to help area developers determine the viability of a wine country area in the Inland Empire. As the grounds proved viable, Carl Key purchased the land and founded Keyways Winery in 1989. In 2004 Terri Pebley, a local commercial real estate broker and legal mediator wanted to list the property as Carl Key was selling. She openly admits that she never intended to get into the wine business. Mr. Key was apparently a very persuasive salesman himself. He convinced Terri that she should purchase the winery, lease it to a winemaker and move into the beautiful home that was on the estate. All went well for several years until the winemaker who was leasing announced he was soon leaving. After months of looking for a new leasee and also searching her own mind and heart, Terri went to work in January 2006 at a new career – winery owner. As you might expect from a resourceful savvy businesswoman, she knew it would take a top-notch team for Keyways to remain in business. 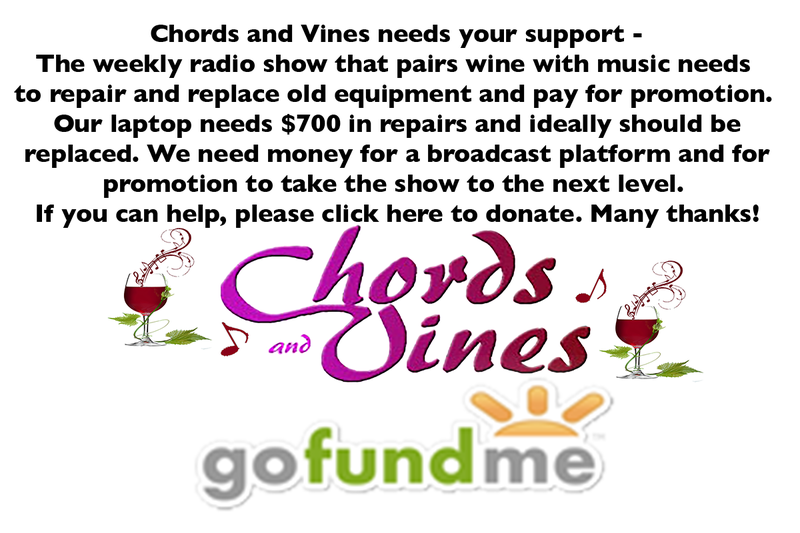 She hired a veteran winemaker to make some samples, a farm management expert to re-plant the vineyards and a designer to renovate the property. Then all that she needed were people to staff the winery. Oh yes, and several million dollars to turn her dream into a reality. By April 2006, all that had not been renovated was the name Keyways and the winery had a new feminine perspective. Pebley, who has since married Jim Delhamer, made a valuable marketing decision. She knew she had a natural instinct for beauty and hospitality. She also knew that women buy the majority of wines in stores and make more suggestions to go wine tasting than men. She chose to focus Keyways marketing efforts toward women. Her overall theme was “the romantic side” of wine country. The tasting room became an extension of her home which sits above the winery. “I wanted it to look like I’m inviting people into my home. “ Tasting room renovation included building an illuminated Brazilian onyx tasting bar, cork floors in the aptly named “cork room”, and providing comfortable fireside seating. Gift items, displayed throughout the tasting room offer shoppers a multitude of unique choices. Delhamer also keyed in on an essential element for women – designing beautiful restrooms with the same Brazilian onyx counters, hammered copper stalls and decorator touches. Thank you, thank you, Terri! The outdoor areas were re-landscaped and designed to offer a variety of event options apart from the indoor Cork Room and Fireside Room. They are the Vineyard Pavilion, Rose Terrace and Garden Gazebo. Acknowledging the surrounding horse country, Keyways boasts equestrian trails on the property and even a hitching post to enable riders to stop by the tasting room. In perusing the current Keyways wine list, I noticed almost an equal number of whites and reds with a few unique wines I had not tasted elsewhere in the Valley. The 2009 “Simply Roussanne” is a slightly sweeter off-dry version of their award-winning Roussanne. A 2010 White Tempranillo is a refreshing off-dry rose’ with lots of bright fruit flavor. “Tempranache” is an estate-grown gem, blending 63% Grenache with 37% Tempranillo. Delhamer does have a hand in naming, blending and tasting all Keyways wines prior to release. This skill is evidenced in tasting the 2008 “Territage”, her own signature Meritage blend. The woman’s touch is also evidenced in the friendly staff and whimsical variety of events happening at Keyways. The winery has three wine clubs with one, “Brix Clix”, designed for women. Monthly meetings offer the opportunity to network and enjoy food and wine while gaining knowledge. Unique special events dot the calendar year-round. Weekends bring live musical entertainment with MoKeyto Saturdays offering Muscat Mojitos with other tasting room choices and Sangria Serenade Sundays. If the weekend finds you hungry, try a KeyZza personal pizza cooked to order. Since Keyways is on the romantic side of town, two Valentine-themed events have been planned. On Saturday February 12, enjoy “That’s Amore” a four-course wine paired dinner with world-class live entertainment. On Valentine’s Day afternoon, I will be taking Mr. WINEormous on “Cupid’s Couple Walk Thru the Vineyards,” complete with chocolate-dipped strawberries – obviously a woman’s touch that I’m looking forward to enjoying. 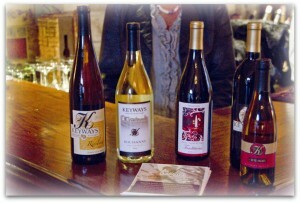 I encourage you to explore the romantic side of Keyways Winery for yourself very soon.